Ontario's premier wants just 25 city councillors in Canada's largest city. 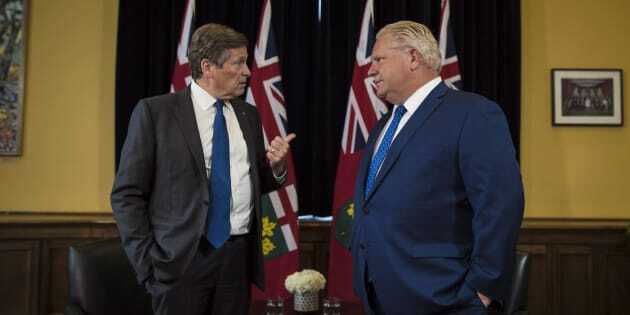 Ontario Premier Doug Ford and Toronto Mayor John Tory meet inside the Premier's office at Queen's Park in Toronto on July 9, 2018. TORONTO — The mayor of Toronto has formally asked Doug Ford to pause a plan to slash the size of city council so that a referendum can be held on the issue this fall. In a letter to the premier, John Tory says members of the public should be able to have their say on Ontario's decision to cut Toronto's city council from 47 to 25 seats. Tory says the plan, abruptly announced earlier this month, is unacceptable and unfair since it comes as the city is in the middle of a municipal election campaign. He asked the province to conduct a binding referendum on the number and boundaries of wards before proceeding with its plan. Tory said the province could also allow a question about the proposed council reduction to appear on ballots in the October municipal election. He says other reforms such as term limits could also be considered at the same time. Ford has said the council-cutting plan would contribute to more efficient decision-making at city council and save money. In the letter, Tory argues that "hitting the pause button" is a sign of strength, and urges Ford to consult more broadly on the plan. "I would respectfully suggest that the legitimacy of your government's position dramatically increases if supported by a legitimate process," Tory said in the letter. "It is always better to do something right as opposed to doing it quickly." The letter also notes that the city has requested advice from its lawyers on the potential for a constitutional challenge of the province's legislation, which is expected to pass next week. Ford's spokesman Simon Jefferies said the government's plan will break the "dysfunction and political gridlock" at city hall. "The Better Local Government Act will help streamline Toronto City Council and make sure they can more effectively deliver on the priorities that matter to the people of Toronto, while saving taxpayers at least $25 million," he said.